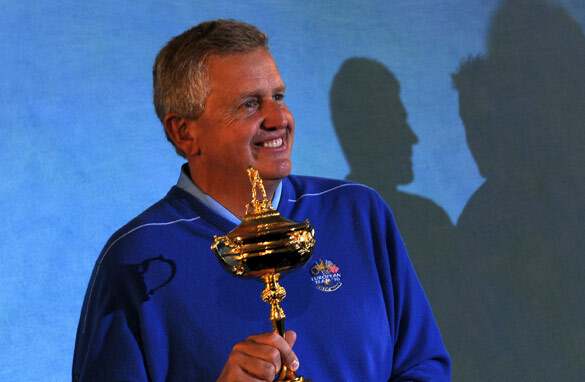 Colin Montgomerie has concerns over his players Tweeting during the Ryder Cup. As everyone with two digits and a keyboard is aware, the Twitter phenomenon is ubiquitous, and in sport it’s no different. Unfortunately, however, it’s also become a double-edged sword. On the positive side, tweeting and other forms of social networking does bring the fans closer to the players, helping sports men and women develop an individual platform that’s good for business. PGA Tour Commissioner, Tim Finchem, said as much when I spoke with him recently at the Tour Championship. “Anything that creates more interest, more exposure, things that people can talk about or relate to, that’s in our interest.” he said. However, while social networking can be an enhancement tool, it can also be a distraction and worse. “I thought I was the captain of a golf team not a tweeting association,” said European Ryder Cup Captain Colin Montgomerie, in response to press inquiries as to whether or not he had banned his team from Tweeting. It was a good humored quip from the Scot, but a real fact of life for managers and coaches of every team or player to consider. How much information is too much information? Who needs to know? And how focused can a player be if he’s planning his next bon mot while he’s supposed to be attending to the job in hand? Granted, as European Ryder Cup team member Graeme McDowell said: "You’re talking about adults who should be capable of setting their own social networking boundaries in order to remain professional." And in most cases that’s true. But such is the immediacy of Tweeting, in which every waking thought, however profound or inane, can be slapped down and rushed out unedited to the world, there’s always the danger of a slip. Take the current case involving former Indian Premier League cricket chairman, Lalit Modi, who’s just been removed from all involvement in Indian cricket in the wake of corruption allegations against him. What sparked the allegations and the resultant investigation? A Tweet giving ownership details of a new IPL franchise which embarrassed a minister in the Indian government, whose then girlfriend had been given a free stake in the new team. Lalit going from hero to zero in 140 characters. And he’s not the only one. England footballer, Darren Bent, got himself into hot water last year by using Twitter to slam the chairman of his then club, Tottenham, over negotiations on a move to Sunderland. Bent at least saw the error of his ways though, and subsequently vowed to stop using Twitter, which he was doing 50 times a day, after a discussion with his new boss at Sunderland, Steve Bruce, who longs for the days when in-house spats stayed in-house. And that’s the problem with Twitter, there is no safety net, which is fine if you’re Joe Public without a platform to build or an image to uphold, but not if you’re a sporting celebrity with responsibilities to your club, team, fans or sport. So is banning tweeting by athletes the right thing to do? Well, that might infringe their civil rights. But if I were an authority figure within the world of sport my message would be simple -Twitter away on what you had for breakfast or what color pants you’re wearing today, but as far as your sport is concerned, tweeting should be strictly for the birds. I am criticising CNN International under world sports. Why don`t you also post the USA sports;; ie. NFL, NBA, baseball, College Football. etc. CNN is so bias that if CNN don`t consider Americans around teh World as Americans want to know want USA sports are dooing, ie. scores, schedules, rankings, etc. Get with it CNN and be American as well as the World. I am sick and tired of your network only covering events outsied the good old USA. Either cahnge your ways or many of us Expat Americans will switch from CNN to BBC out of spite. Do the right thing. I strongly believe that you cannot hold back the growing social networking trend. Facebook twitter, and other ways of keeping in touch and telling people what's going on, is here to stay, and will ultimately bring people closer together. A sportsman's popularity with his fan's can increase a lot by the use of social media, giving the fans an insight into his/hers daily whereabouts and providing a feeling of a more close relationship between the star and the fan.